City and foundation money will be spent to upgrade the 12 most deteriorated playgrounds in Milwaukee. A child of immigrant parents, Milwaukee Common Council President Michael J. Murphy said his family didn’t have much money, or go on many vacations, but he always had the playground. 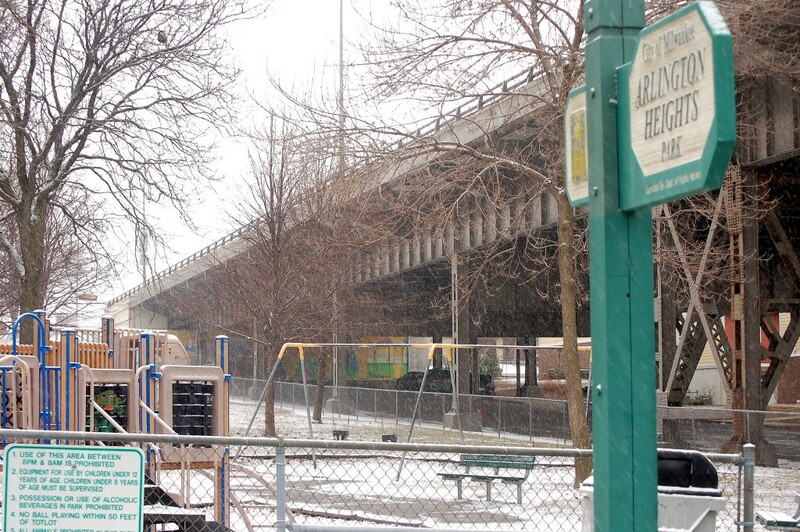 “I grew up on the playgrounds,” Murphy said. At a time when obesity rates in the city are rising and children are living increasingly sedentary lifestyles, Murphy wants more kids in Milwaukee to share the experiences he had growing up — getting exercise and learning how to socialize at the neighborhood playground. That’s what he envisions with MKE PLAYS, a new initiative aiming to turn the city’s 12 most deteriorated playgrounds, as evaluated by the Department of Public Works (DPW), into neighborhood centerpieces by October 2018. Most of the playgrounds are pocket parks, on a single lot. A key component of the initiative is to involve residents in the planning and eventual building of the playgrounds. Each park will have a four-member ad hoc board selected from the community. These won’t be just any playgrounds, noted Murphy. He said Imagination Playgrounds, which are designed as interactive, transformable spaces, or Freenotes Harmony Parks, which are based on outdoor musical instruments, are some of the possibilities for the play spaces. The cost of innovative reconstruction of the 12 parks is estimated to be between $1.6 million and $1.9 million, compared to a traditional reconstruction cost of $1.3 million. The 2015 city budget only provides $165,000 for playground improvements. Enhancing where the children play and communities socialize, will uplift the communities where the playgrounds are located, Murphy said. It’s all about “giving agency back to the neighborhoods” where these parks are located, many of which are in the poorest neighborhoods in the city, said Sarah Zarate, staff assistant for Murphy. “If the community is involved from the beginning, it will also create a heightened sense of ownership and long-term sustainability,” Zarate added. The process of securing a mix of private and public funding for the initiative has begun. The Zilber Family Foundation was first to jump on board, pledging a $300,000 two-to-one matching grant with the city for reconstruction of three parks, Arlington Heights and Trowbridge Square in Layton Boulevard West, and one in Lindsay Heights, at the corner of North 17th and West Vine Street. Both neighborhoods are part of the Zilber Neighborhood Initiative. Zilber will also provide a Trinity Fellow to work on the community engagement portion of the plan. The Fund for Lake Michigan has also pledged $25,000 for MKE PLAYS and discussions are under way with Milwaukee Public Schools, which will give students jobs as play leaders at the parks. 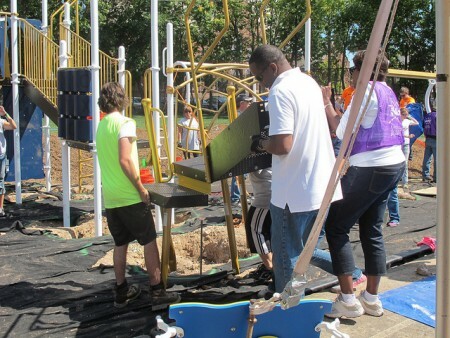 The initiative is a departure from the top-down approach to playground repair, in which the DPW surveys equipment to determine what needs to be replaced. The dwindling of city funding available for playground repairs over the past 15 years has resulted in many of the 100 city-owned play areas falling into disrepair, according to Zarate. More than 60 city playgrounds are currently deteriorated, said Susan Lloyd, executive director of Zilber Family Foundation. Lloyd said one reason Zilber chose to support the initiative is because it is consistent with its approach of engaging community members in meaningful ways. Doing so will make the neighborhoods safer, she added. “Collective efficacy is a stronger predictor of safety in a neighborhood than poverty or race,” Lloyd said. Arlington Heights Park will be the first park to be renovated and Layton Boulevard West Neighbors (LBWN), a local nonprofit serving the neighborhood, will support the community engagement portion of the plan, according to Jezamil Vega-Skeels, director of catalytic projects for the organization. LBWN has been working for years to improve the park, adding a bandshell in 2013, among other amenities. That hasn’t necessarily translated into higher usage of the playground, said Skeels. She said that should change with a park design that takes into consideration the unique needs of the surrounding community. “There’s so much potential here in terms of innovative design and organized play for the children,” Vega-Skeels said. As part of the initiative, the playground Murphy grew up in on West Wright Street and North 55th is also slated for reconstruction. Renamed the Marcus DeBack playground, after an 8-year-old boy killed by an errant bullet there in 1995, the park needs at least $110,000 in repairs, according to city estimates. Giving the playground a facelift won’t be a cure-all for that neighborhood, or any of the others in which the parks are located, but it is a start, said Murphy. He said neighborhoods with high poverty and crime don’t usually see a lot of investment, but he hopes MKE PLAYS will spur more. Most importantly though, “I just want to see playgrounds full of children who have the same opportunities that I had while growing up,” Murphy said.